licensing issues in technology transfer. 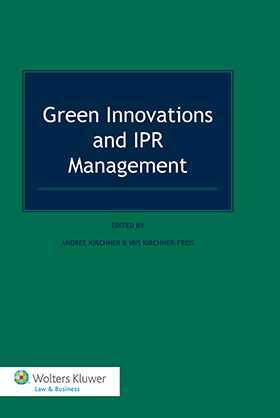 Although primarily intended for professionals concerned with the legal aspects of green technology – lawyers, policymakers, agency officials, academics – this book will also be of great value to inventors and technology companies as a guide to mechanisms for managing and sharing intellectual property rights in the context of green innovations. It is sure to engage a wide audience for years to come. Part I: Green Intellectual Property Rights. Chapter 1. Legal Aspects of Green Patents; E. L. Lane. Chapter 2. Legal Aspects of Green Trademarks; I. Kirchner-Freis, A. Kirchner. Chapter 3. Best Practice: Eco-Label with Brand Character: Reliable Product Labelling of Type I According to ISO; S. Heutling, I. Oehme. Chapter 4. Nordic Ecolabelling: An Introduction; R. Unge. C. Green Designs / Eco-Design. Chapter 5. Legal Aspects of Designs; M. Schötelburg, J. Pinkowski . Chapter 6. Best Practice: Developing Environmentally Friendly Products: Potentials and Challenges of Eco-Design; S. Zhao, K. Rath, H. Birkhofer. Part II: Exploiting Green Innovations. A. Technology Transfer and Licensing. Chapter 7. Technology Transfer and Licensing; I. Kirchner-Freis, A. Kirchner. Chapter 8. IP Charta as a Guideline for a Sustainable IPR Management; K. Uckel . Chapter 9. IPR Management and Technology Transfer; G. Caratti, H. Kebapci. Chapter 10. Alternative Approaches to IPR Management; I. Kirchner-Freis, A. Kirchner. Chapter 11. Resource Regimes and Resource-Monitoring as New Instruments of a Sustainable Resource Management; G.Müller-Christ. Chapter 12. International Climate Change and Technology Transfer: General Framework and Recent Developments; L. Schiano di Pepe. Chapter 13. Greenhouse Gas Emissions from Ships and Technology Transfer; X. Hinrichs Oyarce. Chapter 14. Green IT; I. Richter. Part IV: Initiatives to Support Green Innovations. Chapter 15. UNEP-EPO-ICTSD Patents and Clean Energy Technology Project; B. Simmons, A. Abdel Latif, K. Karachalios. Chapter 16. WIPO Green: The Sustainable Technology Exchange; A. von der Ropp .